Building homes in Western New York for 40 years. Located on Southwestern Blvd. (Route 20), in the Town of Hamburg, NY, Brookview is a luxury apartment community set in a wooded area adjacent to Foster Brook, a tributary that runs through what will be extensively landscaped grounds. Each building has a partial brick front, security doors to insure residents' privacy, laundry facilities and individual storage units. Each apartment features modern kitchen appliances including a microwave, air conditioning, optional in-unit washer and dryer and a covered balcony or patio. Stay warm all winter with free heat. Brookview's Clubhouse features an outdoor pool, fitness center, WiFi, access to fax/copy machine, community room and a kitchen for residential use. There is also a kid friendly playground. Check out our corporate apartment for lease. The 2 bedroom upper unit is fully furnished and includes all utilities. 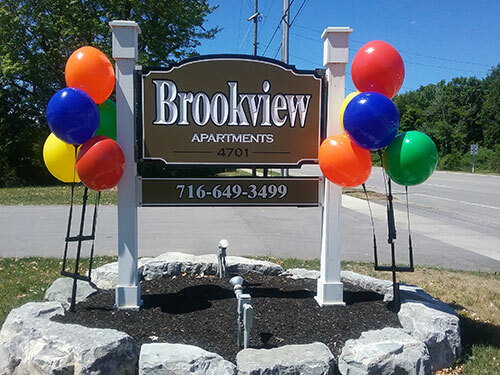 Call (716)649-3499 for more information about our corporate apartment!